Exposure to sun and light are most common reasons for the appearance of melasma as ultraviolet rays from the sun can stimulate pigmentation via melanocytes within the skin, which leads to those exposed areas having darker patches as compared to the rest of the skin. Irritation of the skin and the healing process can leave remnants of staining after it has healed. 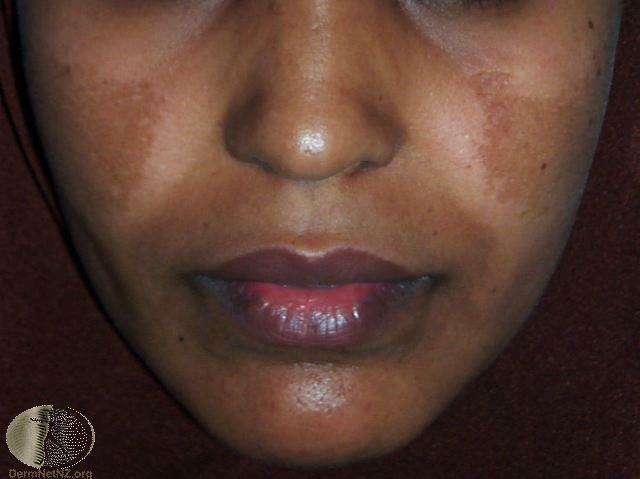 Melasma can be easily diagnosed by a dermatologist during a skin examination; in some cases, a skin biopsy may be required to confirm the diagnosis. Treatments that are available for this skin conditions may not work for every case and prevention via daily application of topical sunscreens (UVB and UVA) or physical items like visors and umbrellas are advised as sun and lighting are the main causes of melasma. Hormonal influencers like oral contraceptive pills may need to be stopped if they worsen melasma. Azaelic and Kojic acids are good agents for depigmentation of the skin, whilst combination creams containing Tretinoin also work well to increase skin cell turnover. Hydroquinone is the main depigmenting agent used and is available on prescription from a medical practitioner. Oral contraceptives, irritating creams, makeup and exposure to direct sunlight are triggers that should be avoided in reducing the occurrence of melasma. Procedures such as skin peels, microdermabrasion and laser surgery may be helpful, especially in combination with cosmeceutical preparations. To go down this route, treatments should be administered by practitioners who are familiar and experienced in treating people of colour.